Know your numbers, improve your health. 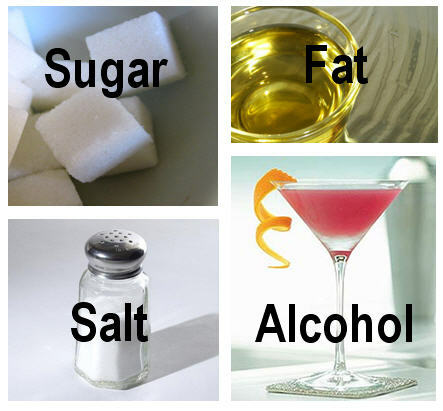 How well do you know: Salt, Sugar, Fat and Alcohol? All are tasty! Consumption of Salt, Sugar & Alcohol should be enjoyed in moderation. All three can bring satisfaction and too much can have a negative effect on an individual, promoting health problems. Salt will lead to hypertension. Reduce your risk of high blood pressure, look for salt that is hidden in: can foods, soy sauce, chicken and meats (injected with saline water), salad dressing, cheese, fast foods, and prepared frozen foods. Daily recommendation of sodium consumption is no more than 2.3 grams per day (1/2 teaspoon) and 1.5 grams for those over 51 years old. Sodium levels reflected in a blood draw should be 135-145 mEq/L. Increased levels are linked to dehydration or renal (kidney) disease. Decreased levels are indicative of heart failure or edema. An individual that suffers from hypertension is strongly encouraged to follow the DASH Diet, designed to promote a low sodium diet and promotes overall wellness. Sugar as we know and enjoy it! What other forms of sugar do you consume? Sugar comes in many forms. A few common names are: sucrose (white), fructose (fruits and veggies), lactose (milk) and glucose (fuel for our body’s energy). Studies of how sugar impacts both individuals and society are being conducted. For now, (within the context of healthy eating) studies show that sugar does not raise blood glucose any more quickly than do other starchy carbohydrates such as potatoes, rice, or pasta. Keep in mind, it is ones best interest to consume fruit, vegetable and grain carbohydrates as the element of fiber (both soluble and insoluble) will stabilize blood glucose levels by ridding the body of what is not important. Fasting glucose normal levels 70-99 mg/dl. Numbers that are over 125 mg/dl will prompt your doctor to ask you to return on a different day to draw blood a second time to better regulate the glucose levels. Oil is a healthy fat that keeps the body well lubricated. Fats, when possible, should be consumed in liquid (unsaturated) form at room temperature. Olive Oil is an example of a healthy fat and lubricant for veins, arteries and organs. The presence of fat assists fat soluble vitamins with digestion and are stored in the liver. 3-4 tablespoons a day will keep the body healthy. 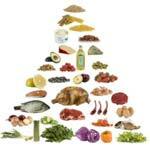 The Meditarranean Diet is an easy lifestyle to follow and allows for an individual to enjoy a wide variety of foods. Reduced amounts of meats should be consumed 3 times a week, 4 ounces/day. Fish is light, easy to digest and contributes to raising healthy (HDL) cholesterol and lowering lousy (LDL) cholesterol. Enjoy fish 4 times a week! Solid fats (saturated) like cheese and butter should be consumed in lesser amounts of 1 ounce a day for cheese and 2 eight ounce glasses of 1% milk of choice (almond, cow or soy). Wine in moderation is good for the body. Alcohol can make your blood sugar levels fall too low and put you at risk of hypoglycemia, so people with diabetes are advised to drink alcohol with a meal or snack and not by itself. Alcoholic beverages and drink mixers contain sugar and carbohydrates, so they must be figured into your overall meal plan. Your body will burn the alcohol as a source of fuel instead of burning fat. If you use insulin, limit alcohol to two drinks per day. Consume alcoholic drinks only with a meal or snack, and do not reduce your usual amount of carbohydrate. Alcoholism is determined through a blood draw. A quick look at potassium levels maybe an indication of kidney or heart problems. Lower levels or potassium is also a clue to a problem with alcoholism. Potassium levels should be 3.6-5 mEq/L. All our favorite vices can be included in our daily diet. Done in moderation, we can benefit from the joy of having them, but excessive consumption can damage our organs. Monitor your blood draw by requesting a copy of your blood results and know your numbers to stay healthy. We are all provided with two equal fist sized organs, found in our lower back on either side of the spine just above the waist called Kidneys. Renal physiology is the study of kidney function, while nephrology is a medical specialty that focuses on kidney disease. In brief, the kidneys perform multiple functions to sustain the life of the body, cleanse the body by removing waste and excess fluid through urine, provide a balance of water, salt, potassium, phosphorus and produce an active form of Vitamin D. Multiple hormones and enzymes are produced in the kidneys and released into the body affecting the function of other organs, signaling red blood cell production, regulating blood pressure (Renin) and calcium metabolism. The degradation of the kidneys can be influenced by a variety of factors. Having regular check-ups is key to kidney health. Do not miss doctor appointments if you have diabetes, high blood pressure, chronic urinary tract infection, bladder issues, chronic lower back pain. Any of all of these factors should be monitored an communicated in a timely manner. When kidneys begin to function improperly an individual may have any, or all of the following symptoms: nausea, vomiting, loss of appetite, fatigue and weakness, loss of energy, sleep problems, any change in output or color of urine, decreased mental awareness, muscle twitches or cramps, hiccups, swelling of feet or ankles, persistent itching, chest pains, shortness of breath, high blood pressure. Symptoms should be discussed with your Doctor. Early detection of kidney disease can be addressed, so that the health of the kidneys can be sustained. A diet low in phosphorus, sodium and balanced protein is critical when addressing kidney disease. Listed below are foods allowed for patients facing kidney issues taken from DaVita who specializes in Renal Disease. Four important points should be reviewed with your Doctor or Dietitian. Consume 800-1000 mg of phosphorous per day. Portion Size is critical to staying in range of low phosphorus. Additional information on the kidneys can be reviewed at The National Kidney Foundation. Learn more about Renal Health, disease and locate professionals that can answer your questions. Fresh or frozen red meats without additives or enhancements are better choices (be sure to check ingredient labels; even fresh chicken and pork may be injected with phosphates and sodium) for a kidney diet. ** Choose meats without breading, marinades or sauce. On average, fresh meat contains 65 mg of phosphorus per ounce and 7 grams of protein per ounce. Check with your Doctor or Dietitian on serving size per meat. While most will say that 3 ounces is fine the following serving size has been modified to a 2 ounce serving size. Fish is a high-quality protein that contains omega-3 fatty acids. Fatty saltwater fish such as salmon and tuna are highest in omega-3, reducing inflammation and protecting against heart disease and cancer. Seafood is an excellent source of very low-fat, high-quality protein. However, there are differences in varieties of the same species. For example, Pacific oysters contain 50 mg more phosphorus in a 3-ounce serving compared to Eastern oysters. Bread is a good source of carbohydrates and calories needed by your body fo renergy production. While whole grain bread is a healthy source of fiber, it also has more phosphorus and potassium than white flour bread. Pasta, rice and other grains are a great source of carbohydrates, calories and B vitamins, plus zinc, copper and iron. For a kidney diet, whole grains like brown rice, oat bran and wild rice ARE LIMITED due to the higher phosphorus content. A half cup of brown rice has 75-81 mg of phosphorus which can add up if you eat a larger portion. Milk and milk products are high in calcium and phosphorus, so finding an acceptable lower phosphorus substitute is a must. A half cup of milk (4 ounces) contains 111-138 mg of phosphorus. Some liquid dairy substitutes can be used in cooking to replace milk, but not all products are interchangeable. Read ingredient lists to look for phosphate additives in nondairy products. Some products are fortified with calcium-phosphate. Beware of the ones that promote “high in calcium” as these are also high in phosphorus. Eggs are a great protein source but also contain 95 mg phosphorus in a large egg. Remove the yolk and phosphorus is only 5 mg for each egg white. Crackers, cookies, candy, fruits or vegetables — all are appealing snack foods.There are many low-phosphorus choices for your kidney diet. All cheese contains phosphorus with most having 120-250 mg per ounce; some contain more than 300 mg per ounce. The suggested portion for a dialysis diet is usually one ounce of cheese 1-2 times a week if phosphorus is controlled. Check with your dietitian for individual recommendations. Cream cheese-based spreads are much lower in phosphorus than cheese-based spreads. Portion control is key when it comes to cheese! Avoid dried fruits which are higher in phosphorus levels including: raisins, prunes, peaches, pears, dates, currants, bananas. Legumes should be reviewed with your dietitian, some are higher in phosphorus and may not be allowed. Most fruits can be factored at 10 mg phosphorus per serving. Some fruits do not have any phosphorus. Fresh fruits with higher levels of phosphorus can be eaten in moderation. Weigh your food carefully to configure the amount of mg/100g. If baking at home, explore substitutes in baking found at DeVita.com. Bakers Active Dry Yeast provides a good solution when baking. Another TIP to adding levitation is to follow the recipe backwards, eliminate baking powder and salt. Beat the egg whites in a separate bowl until foamy, add a few grains of cream of tarter, beat another 10 seconds. Lastly, fold egg whites into the other ingredients. European spa’s know it and sell it at their Benessere Resorts (well-being)! The style toted by european women is practiced weekly as they go to local salons and focus on their natural beauty. When referencing the body it’s as simple as name dropping, just say the German words “Haar and Haut” and you have “Hair and Skin”. Vitamin H derives its name from Haar and Haut (also known as Biotin/B7) therefore, this vitamin is critical in the making of: skin, hair cells, breaking down fats and producing fats metabolized from protein/amino acids as it assists key enzymes (carboxylase) to produce what is necessary for life. Carefully understanding the word metabolism allows for easier comprehension on how and why we can better do better in improving or maintaining a lean machine. Metabolize comes from the Greek word Metabole meaning Change. 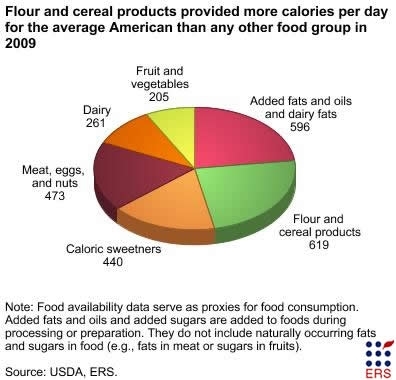 We count on our metabolism, to break down carbohydrates, proteins, and fats into smaller units; those units are reorganized as tissue building blocks (or as energy sources) and then waste products are eliminated and removed based on what our body cannot use. In order for a body’s enzyme’s or hormone’s to do all this work, it needs an assistant (referred to as co-enzymes) like biotin so that principle enzymes can participate in the production and building of healthy bodies. Improving daily intake of vitamin H is easy to do by choosing one of the following foods and including it into a well rounded diet. Best foods for Biotin/Vitamin H/B7 are: cooked egg yolks and whites, liver, fish, peanuts, peas, cauliflower, corn and grains. Biotin is produced in the intestines through bacteria as well. Vitamin B7 is also found in synthetic form. Interference of proper uptake of vitamin B7 can happen through consumption of alcohol, which limits or prohibits the co-enzyme to function, as well as eating of raw eggs. Research shows that the raw egg white holds the protein Avidin which can interfere with Biotin which is found in the egg yolk. Therefore, it’s advised that if biotin deficiency is determined in an individual, that one should cook the egg so that avidin is denatured upon cooking, while biotin remains intact. Those who are pregnant, lactating, or athletic may need extra vitamin B7 and should consult their doctors to have their levels of biotin checked. Biotin/B7 deficiency can be noted by causes of skin rashes (dermatitis), nail and hair (alopecia) loss, conjunctivitis (pink eye) and tingling in extremities. It may also result in weakness, depression, hallucination, numbness, fatigue, irritation, rashes, loss of appetite. We can still enjoy the care of “Haar and Haut” at our local hair salons for cuts, pedicures and manicures! However, with accurate dietary information in hand, knowledge and proper care of oneself can improve lifestyle and attention to what will bring about physical success. The pomegranate fruit is obtained from a tree that is originally native to the Southwest Asia and is cultivated since centuries together. Pomegranate is widely cultivated throughout the Afghanistan, Iran, Azerbaijan, Armenia, Turkey, East Indies, Malaysia, tropical Africa and southeast Asia. Later on, it was also introduced to the US and Latin America. The fruit is typically available from November to February (in the northern hemisphere), while in southern hemisphere, it seasons from March to May. There are more than 750 species that are observed and cultivated all over the world for various purposes from eating to forming pomegranate juice. The name pomegranate literally means “the apple with many seeds”. The number of seeds in a single fruit varies from 300-1000. Pomegranate tree can live up to many years, which is an advantage for the pomegranate growers. This way, it enhances the outdoor decoration of the house with additional fruits provided. The fruit of pomegranate is ruby colored with many seeds that are both juicy and citrus in flavor. Pomegranate seeds nutrition facts are just numerous and therefore, pomegranate seeds are used for many purposes from ancient times. Often called as super fruit, the invaluable pomegranate seeds are loaded with numerous antioxidant properties that are said to be three times higher than the green tea. As we know, antioxidants are very important to control the free radicals from the body that can cause several troubles to the body. Antioxidants also maintain and repair the damaged body cells. Pomegranate is high in vitamin C, vitamin A, folic acid, vitamin E , fiber, potassium, iron and calcium. Cardio health and reduces risk of strokes and heart attacks. Contributes to proper thinning of the blood, reduce blood pressure levels, increase blood flow towards heart. Maintains good cholesterol levels (so that HDL cholesterol is elevated) and reduces arterial plaques. Read on for health benefits of pomegranate juice. Researchers are carefully observing the effects of pomegranate juice and prostate cancer as well as skin cancer. There are numerous products that are used by the pomegranate seeds including: pomegranate seed oil , pomegranate dietary supplements, pomegranate extracts and pomegranate concentrated juice. Due to the polyphenols (anti oxidant) within this wonderful fruit it’s nutrition promotes anti inflammatory effects which strengthens the immune system, wound repair and reduces skin wrinkling making it’s derivites the most sought after when addressing skin remedies. Lettuce Leaves: Endive, Rucula (Arugula), Spinach, Green Leaf Lettuce. Tear into bite size. Wash Pomegranate, Apple and Lettuce leaves. Over a salad bowl cut Pomegranate into quarter pieces, invert each piece so that the skin is push inward and the seeds com outward. Seeds will easily come out. Make sure to remove white pith that the seeds are attached to, discard pith. Cut apple in half, remove and discard seeds. Cut apple into chunks place into bowl. Add feta cheese and lettuce into salad to salad bowl. Toss well so that all ingredients are incorporated. Place all Dressing ingredients into a bottle or bowl, cover tightly, shake ingredients so that they are well combined. Pour dressing onto salad 5-10 minutes before serving. Can Maple Syrup Benefit Diabetes? 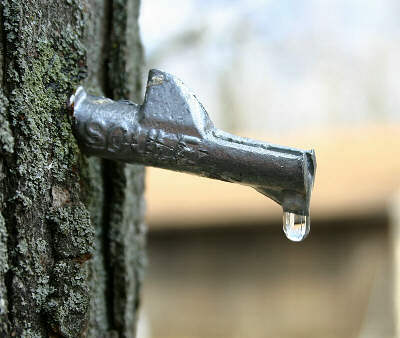 Recent research done on Maple Syrup compares and contrasts the Maple Trees’ protein’s, hormone’s and enzyme’s and how they may positively impact Diabetes in human’s. Too good to be true? While sugars have to be monitored in a diabetic diet, researchers are going deeper and exploring Abscisic Acid’s importance in an individual’s diet. Before adding maple syrup to your diabetic diet talk to both your Doctor and Diabetes Educator so that they can monitor any changes that you make in your diet and accurately document your blood chemistry.